My travels this past week took me to the West Coast. Anaheim, CA to be exact. When I checked into my room I fired up Google Maps and looked for something close to my hotel that was not a chain. Lucky for me, only one block away was a local Mexican restaurant by the name of La Casa Garcia. So, after a quick conformation that the place was good by the front desk, I set out on my little Mexican adventure. After scanning the menu, I decided to go outside my little box and have Chile Verde for the first time. Chilebrown over at Mad Meat Genius is always on a quest to find the perfect Chile Verde, so it has to be good. Right? Well lets see. First, I was brought my obligatory bowl of chips and salsa. The chips were excellent. Not too greasy, as restaurant chips can be, and a hint of salt. The salsa was flavorful. Not overloaded with cilantro and packing a nice kick at the end. Good start to the evening. Each dish came with a soup or salad. So, I decided upon another first, a bowl of Albondigas Soup. Albondigas Soup is a traditional Mexican meatball soup. 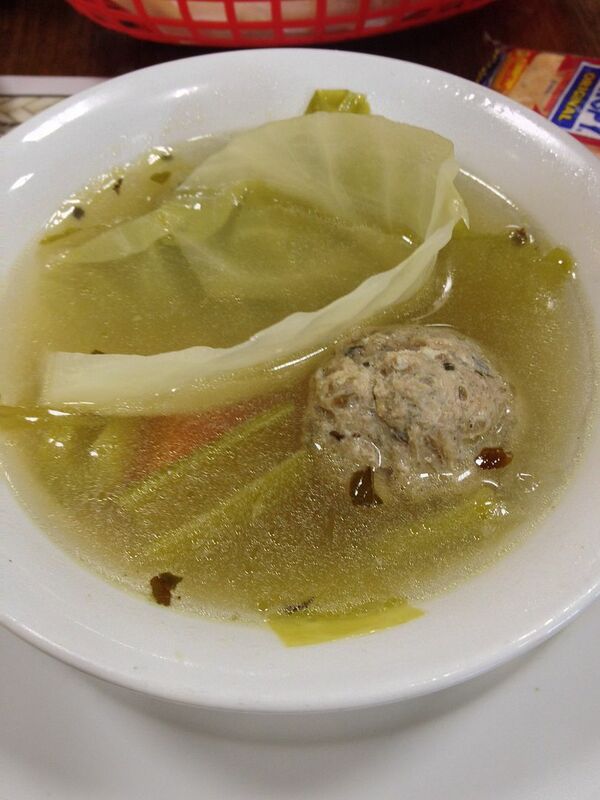 It is usually a chicken stock base with beef meatballs. One bite and I was hooked. This broth was some of the best restaurant soup I had ever had. The meatball was tender, juicy, and perfectly seasoned with a touch of cumin. Not overcooked at all. The vegetables were nice and tender crisp as well. Round two, success. Next up, the main course. 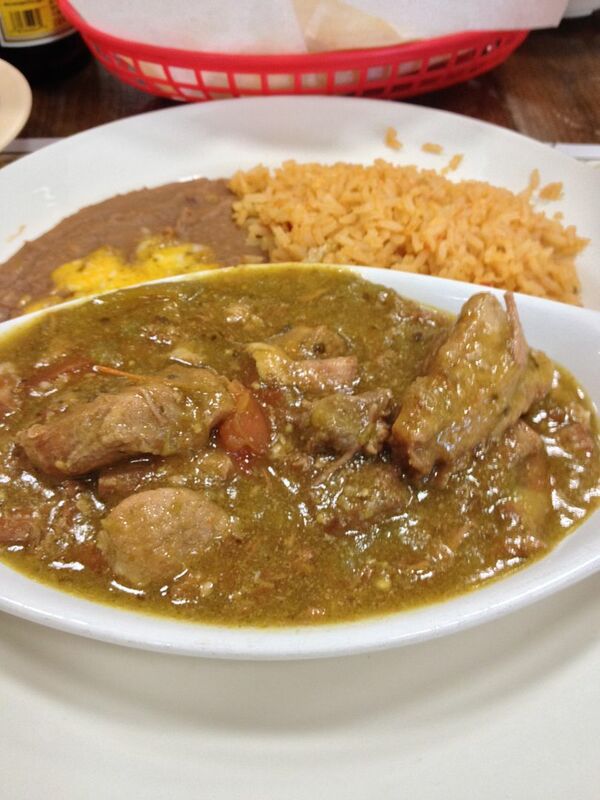 Chile Verde is a sauce of tomatillos, jalapeños, garlic with chunks of slow cooked pork. This sauce even had chunks of fresh tomato added in for good measure. It was outstanding. The pork was perfect. I grabbed a fresh tortilla and scooped some of this bounty inside. I was expecting a spicer sauce. But, I was not disappointed. A hint of spice, this sauce was bursting with flavor. When I ran out of tortilla and meat, I started scooping up the sauce with my tortilla chips. Why haven't I tried this before? The refried beans were excellent, but the Mexican rice was a bit bland and under seasoned. It didn't matter to me. Just starchy filler in my mind. 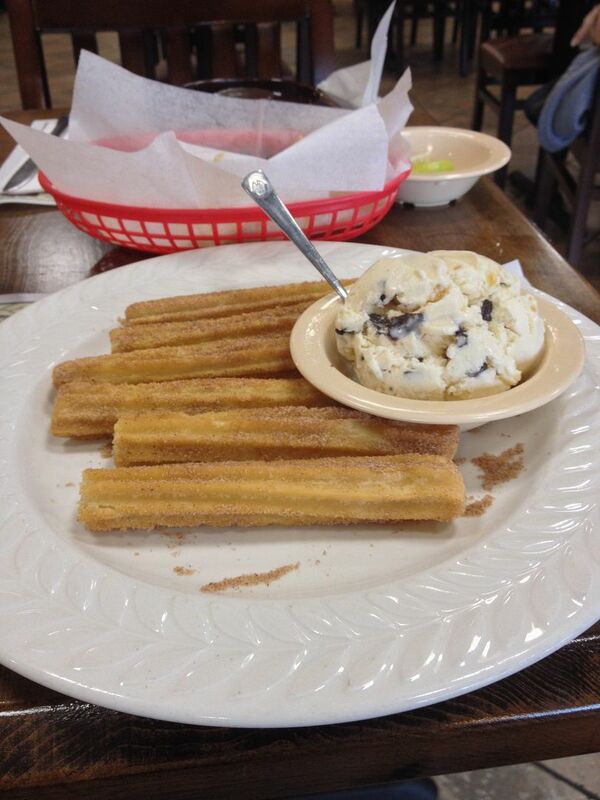 For an encore, I totally wrecked my diet and ordered some churros. Again, very good. Any churro that I have ever had was overcooked and dry. Not these. Crispy and lightly sugared on the outside, soft and pillowy on the inside. My only wish was that they had served them with honey and not ice cream. This was a great experience. Now I see why Chilebrown is on a never ending quest for the perfect Chile Verde. I just may join him in his quest. If you are in the Garden Grove district of Anaheim and in the mood for Mexican food, La Casa Garcia has my recommendation. Grade: A. To begin my reply, I will never go to this restaurant. The chileverde looks decent enough but this place is located in Sourhern Ca. and it just is not going to happen. I strongly dislike the southern part of the state. 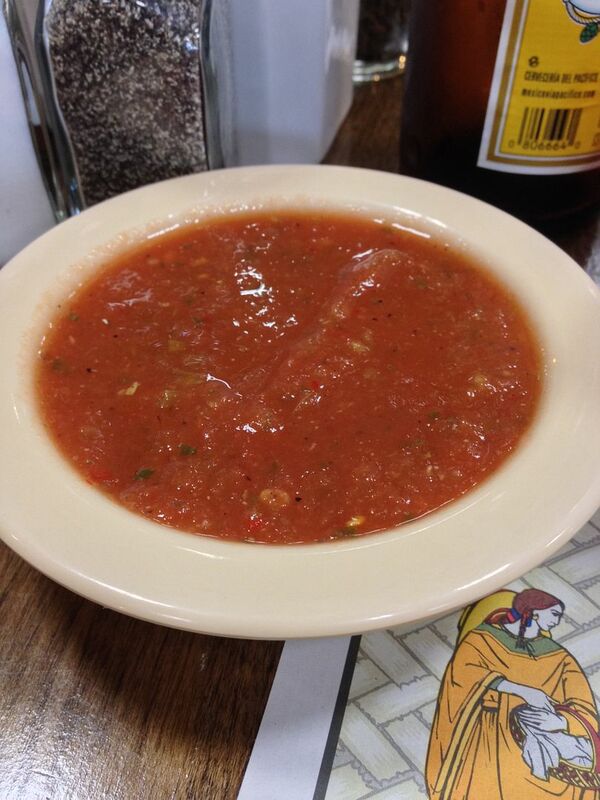 The salsa that comes with the chips is a good indicator of the meal to come. It the place takes the time to make a good, tasty salsa that usually means good food to come. Also just for clarification true chileverde is typically made with Anehiem or New Hatch style peppers. Jalapenos are sometimes used. If this restaurant was located somewhere else I would love to try that good looking dish of chileverde. While I do like Northern Cali better than So. Cal, why the strong dislike? It is kinda of a long story that was passed down from my father. It has to do with attitude, sports teams, water rights, taxes and representation and so much more. It is one of those things that is an understanding of residents. Understandable Chilebrown. Thanks again for the heads up on the chile verde.